Westminster College, New Wilmington, Penna. It is with the blessing of His Eminence, Archbishop Kyrill of San Francisco and Western America, that I am here today, and I am indeed enormously grateful to him for this invitation, and honored to have this opportunity to speak to you in this significant anniversary year, when the 100th anniversary of the martyrdoms of the Holy Royal Martyrs, Emperor Nicholas II and his family—and other members of the Imperial House of Russia—are being commemorated. Before I begin, however, I must express my thanks as well to so many others that helped make it possible for me to be here. First, His Grace Bishop Theodosy of Seattle and His Grace Bishop Irenei of Richmond and Western Europe, who preside over today’s commemoration. Also, Archpriest Alexey Kotar, the Dean of the Northwest and host of today’s conference; Archpriest David Moser, the organizer of the conference; Archpriest Paul Volmensky, who has done much to arrange the advance announcements for today’s lecture and for its audio and visual recording; and Archdeacon Peter Karakozoff, who conveyed Vladyka Kyrill’s initial invitation to me and has answered every question that popped up along the way. Thank you all. Let me finally thank the good parishioners and the sisterhood of St. Nicholas Cathedral, who have done so much for the banquet to follow and who have handled and resolved the innumerable little issues that inevitably arise whenever a gathering as large and complex as this one is organized. Again: thank you all. The topic I have been asked to discuss, of course, is the centennial of the execution of Tsar Nicholas II. As a sign of respect for all of you, and also as an indication of my respect for this important historical occasion, I want to treat this as a formal talk and to read my lecture to you from a prepared text. I will keep it fairly short by Ph.D standards, leaving plenty of time for questions at the end. And I hope you will have questions. I’ll go for about 35 minutes or so, and we can carry on the discussion for as long as we want after that. The words are well-known among historians, but their meaning has not been as clear as maybe the emperor had intended. Most historians have interpreted them as an indication of Nicholas’s presumed stubborn and obstinate hold on an institution—autocracy—which, these historians say, had outlived its usefulness. They focus on the word “autocracy” in that quote, a term that defines a political system where the sovereign’s power runs unchecked by any formal legal limitations: no constitutions, no parliaments, no infringements social or otherwise on the power of the emperor. But I want us instead to focus on his reference in this speech to his father, Emperor Alexander III, called the Peacemaker, “of blessed memory.” True, Alexander III has among some historians an even starker reputation for autocratic rule than his martyred son does. But what we find most interesting in these lines of his speech, I think, is the responsibility Nicholas II felt not to rule in a certain way, but to uphold a tradition he had received, and to pass it on to his successors. Nicholas II was a traditionalist generally. No specifically. Indeed, Nicholas II may well have been just as jealous to uphold a constitutional monarchy if that had been what he had inherited from his father. All that mattered, it appears here and in other statements from the tsar, is the continuation of the Romanov dynastic tradition. This anniversary year has also attracted the attention of legitimate scholars, as well. But not always with better outcomes for the Romanov Dynasty. Just a little more than two weeks ago, the Washington Post, no less, published a truly unlearnèd article by a preeminent Russian history professor, who spent his active years at the University of Oxford and wrote influential biographies of Lenin, Stalin, and Trotsky. The piece is entitled “Five Myths About the Romanovs,” Three of the five Romanov myths pertained to Nicholas II, and none ventured further back in the dynasty’s history than Peter the Great’s reign (who ruled from 1682 to 1725), leaving the first three Romanov tsars mercifully alone. (Let’s remember that the dynasty began in 1613!) Of the three about Nicholas II, two are absolutely right: Despite myths to the contrary, no one in Nicholas’s family or entourage escaped the brutal executions in Ekaterinburg on the night of July 16-17, 1918. Everyone died a martyr’s death that night, and all the pretenders who came afterward were just that: pretenders. And despite myths to the contrary, Nicholas II wasn’t a puppet of Rasputin, and the evidence is plentiful that the emperor took no political advice from the so-called “mad monk” (who, we know, wasn’t a monk at all), and sent him away from court more than once and regretted every time he returned. But the third myth about Nicholas II treated in this article is particularly egregious and error-ridden. 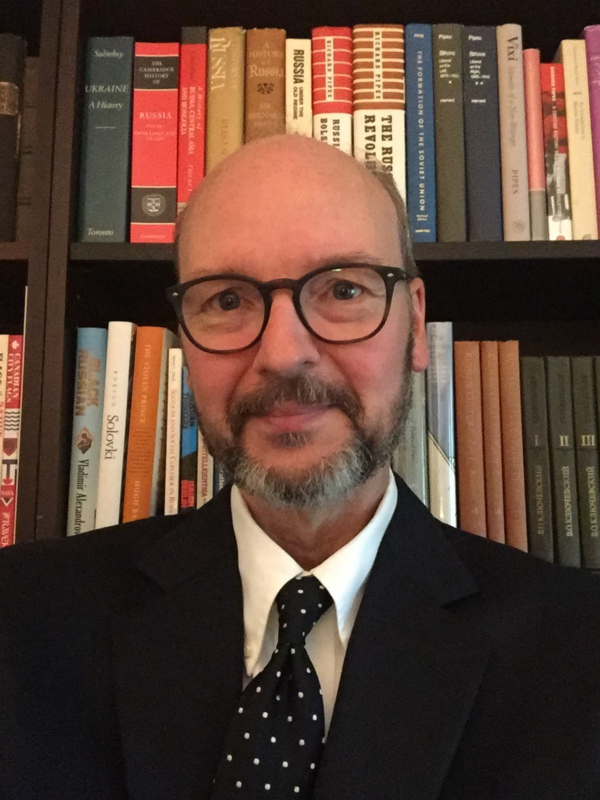 The myth that this Oxford historian wants to debunk is that Nicholas II was a “decent man.” Despite the mountain of evidence that he was, indeed, a considerate, moral, well-mannered, and highly educated man of his day, this historian instead alleges that he was “an incorrigible anti-Semite” and “a fascist before the word was coined.” Such judgments are more than just unlearnèd and harmful distortions of the historical evidence. Nicholas II and his reign have been studied well enough by now to know that such charges against him are not rooted in honest and rigorous scholarship. But it isn’t our task today to correct that error. That I leave to the many scholars, Western and Russian, who have produced nuanced and scholarly books and articles on the reign and have come to a very different conclusion than our Oxford colleague. Our task here today is to commemorate the tsar and to situate him in his dynasty, a task that shows us that Nicholas was not only decent, he was dutiful—a man devoted to his family broadly conceived, meaning his dynasty. Still, there is one good thing about this otherwise wholly dismissible Washington Post article. 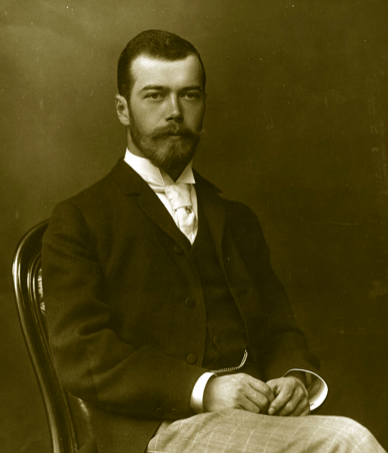 It places Nicholas II in the context of the dynasty, which is how I would like you to consider him. The evidence is clear that that is how he saw himself: as his words in that speech about autocracy in January 1895 shows, as his regard for Russia’s 17th-century culture, architecture, and literature shows, even as the names (and patron saints) he chose to give his children show. 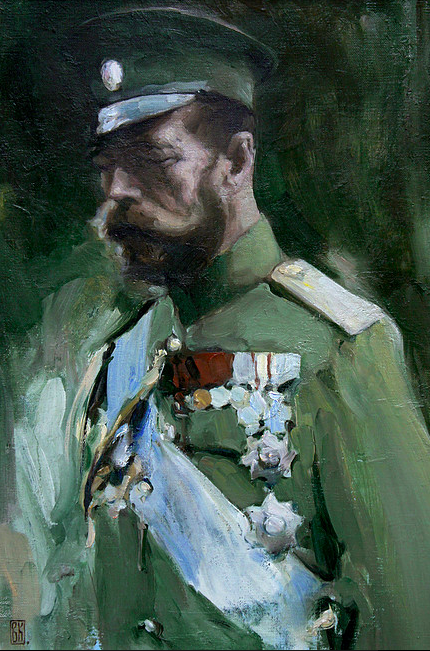 However else Nicholas II may be remembered—for some, as a villain; for others, as a dutiful monarch trapped in impossible circumstances; for still others, as a holy royal passion-bearer—Emperor Nicholas II viewed himself as a member of the Romanov Dynasty, as the bearer of a dynastic tradition that he was convinced—“firmly and unflinchingly”—he had a duty to continue and protect. What I want to do in the remainder of this talk is to explore that dynastic tradition by offering a few general words on the history of the Romanov dynasty, and on Nicholas II’s stewardship of the Romanov dynastic tradition. My thought is that, if we start with the context Nicholas II himself felt was most vital to him—the dynasty—we may begin to understand him more than a TV show or hostile historian can. In turn, that better understanding can provide us with a proper foundation for commemorating in truth a man who deserves to be remembered. So, what were the dynasty and its traditions to which Nicholas II was so devoted? The Romanovs weren’t the Romanovs when they first appear in the historical record in the year 1347. Their ancestor, Andrei Kobyla, is already listed as a boyar at his first mention in the chronicles, the highest rank of servitor in the court of Grand Prince Simeon Ivanovich of Moscow (who ruled from 1340 to 1353). There are some fanciful genealogies out there that attempt to push his ancestors further back in history, but most of these genealogies were concocted later, after the Romanovs had come to the throne, and are therefore suspect. But we do know a lot about Andrei Kobyla’s descendants, who served the Riurikovich grand princes of Moscow generation after generation in prominent positions. We also know that Andrei Kobyla was the ancestor of many prominent boyar families, not just the Romanovs—too many to list, but some names may be recognizable, such as the Kolychevy and Sheremetevy. And we know that the last name of the family we today call the Romanovs changed every other generation: from Kobylin, to Koshkin, to Zakharin, to Iur’ev, to Romanov—each name taken from the first name or nickname of a prominent member of the lineage. The Romanovs are therefore an old and illustrious boyar family, rooted in service to the rulers of Moscow since nearly the very beginning of the principality of Moscow. But their station was catapulted to an even higher level when Tsar Ivan IV (whom we know better as “the Terrible,” Иван Грозный) married his first wife in February 1547—a Romanov, Anastasiia Iur’eva (her father, Roman, gave his name to the subsequent dynasty). Ivan was 15 when he married, and he was an orphan. His father, Vasilii III, had died in 1533, and his mother, Elena Glinskaia, died in 1538. In 1547, Ivan had reached the age of his dynastic majority (which was 15), but a search for a bride for the tsar had been going on for about a year already when he picked Anastasiia. I say “picked,” because Ivan picked her out of a bride-show (or smotr nevest), the custom of gathering all eligible women—eligible meaning beautiful, virtuous, and showing every sign of health and vigor—from across the realm who were presented to the tsar, and from which assembly he picked the one he wanted to marry, without apparent concern for ancestry or politics. It was a beauty contest, one the Russians had borrowed from the Byzantines. And Anastasiia was the winner of that contest. Of course, there was a lot of politicking behind the scenes in making that choice. The bride’s health and appearance were investigated and assessed, to be sure; but so were their genealogies—not so the tsar could marry the most illustrious candidate by birth, but precisely the opposite: to make sure that the candidate was not too closely related to one faction or another of boyars at court, which would disrupt the careful balance of forces surrounding the ruler. 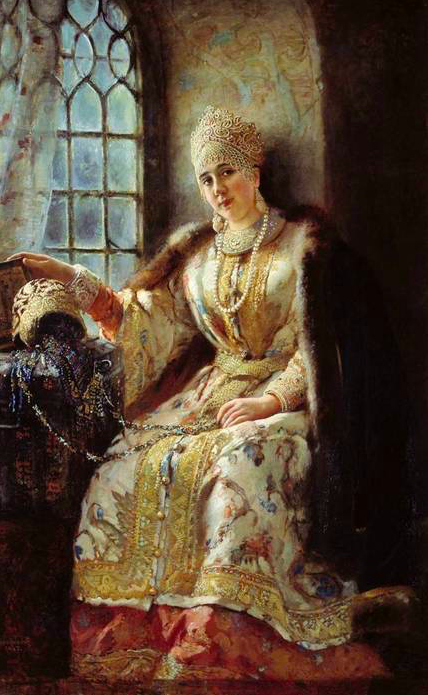 Anastasiia fit the bit in every way: she was beautiful, virtuous, evidently intelligent, and not too closely related to the boyars because she came from a branch of the Romanov family that hadn’t become boyars. She was a safe and beautiful bet, and the tsar, by all accounts (most of them written later) fell in love. The Romanovs thrived during Ivan’s reign until Anastasiia’s death in 1560. Recent forensic studies of her remains have revealed that she had inordinately high levels of mercury in her bones and hair, suggesting that she may have been poisoned. Certainly Ivan believed she was, and this belief may be behind his erratic and volatile behavior through the rest of his reign. But the jury is still out on this: mercury was often used as a medicine in the 16thcentury, not just as a poison. Ivan himself is known to have sniffed a pot of boiling mercury kept on his bedside table to relieve his chronic back pain. Ivan the Terrible died in 1584, having married yet another 6 times, for a total of 7. Anastasiia’s Romanov relatives survived these topsy-turvy times, and emerged as one of the most powerful families in the reign of Anastasiia’s and Ivan’s son, Tsar Fedor I. With Fedor’s untimely death in 1598, however, Russia collapsed into a period called the Time of Troubles, which witnessed pretenders to the throne, usurpations of the throne, peasant and Cossack uprisings, and the invasion of Russia by the Poles and Swedes. That all ended in 1613, when the Assembly of the Land, or Zemskii Sobor, convened in February and called Anastasiia’s grandnephew, Mikhail Fedorovich, to the throne as tsar. Historians still debate why the Assembly’s choice fell on him, but I tend to agree with those who see the marriage of Anastasiia and Ivan—and the marriages Anastasiia’s relatives contracted with the other great boyar families—as crucial to their elevation to the throne. 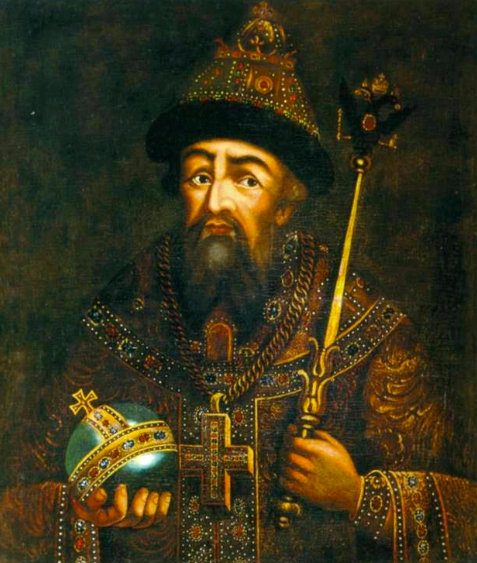 Those assembling in Moscow in February 1613 must have understood as well as we do today that a Romanov tsar was the best path to a restoration of stability and peace because it meant that all the warring factions of boyars could again be members of the inner circle of the tsar’s court because they were all relatives of the Romanovs. The Romanovs thus represented a continuation of the Old Dynasty and a continuation of the old boyar elite—something no other candidate between 1598 and 1613 could do. It was those kinship and marriage ties that made the Romanovs succeed where others—two Godunovs, a Shuiskii, and a handful of pretenders—had failed. Thus the Romanov tradition that Nicholas II sought to preserve was older even than the Imperial House of Romanov. It reached back six centuries into Russia’s past and intertwined with Muscovy’s extinct ruling house. The Romanovs were a native-born dynasty that had experienced Russian history from the front row. And in 1613, it took the stage. Nicholas II knew all of this history very well. We know he knew this because he was one of the figures behind the year-long celebration in 1913 of the Tercentenary of the Romanovs, marking the anniversary of the calling of the Romanovs to the throne in 1613 and the continuous, unbroken rule of the dynasty for 300 years. That year, 1913, was an intellectual feast for anyone interested in Romanov history: serious scholars wrote books, authors wrote plays, composers wrote and performed musical works, public ceremonies marking significant moments in the 300-year-long history of the dynasty were staged, saints were glorified, churches were built. The Tercentenary still awaits a proper scholarly treatment, but we know enough even now to say that Romanov history was an industry at the turn of the 20thcentury. That history was colorful, to be sure. The first five tsars and the seventh came to the throne as teenagers (and an eighth as an infant), four were women (who were among the most important of all Romanov rulers), there were two husband-wife teams (both Peters and Catherines), and there were five assassinations. There was Peter I the Great (who altered in fundamental ways the country’s course), Catherine II the Great (who solidified its western turn), Paul I (who doesn’t get enough credit! ), and Alexander II, who liberated the serfs and reformed the army, the courts, and local government in the sweeping Great Reforms. Eighteen Romanovs ruled between 1613 and 1917. Muscovy comprised 2.8 million sq. km in 1533, a dozen years before Tsar Ivan IV married Anastasiia. Nicholas II reigned in 1914 over an empire of 22.4 sq. km (almost 1/6 of the Earth’s land mass)—a six-fold increase. The British Empire may have been a smidge bigger, but few empires in world history grew so fast and so vastly as did Russia under the Romanovs. And the achievements were not just about territorial expansion. In the fields of the arts, the sciences, and industry: the achievements of Romanov Russia were enduring and influential. As the Grand Duchess Maria Vladimirovna put it in a recent speech, paraphrasing: While Russia may have borrowed copiously from, and been influenced by, the West for many centuries, by the nineteenth century, it was the West that was borrowing from and being influenced by Russia—in the arts, literature, music, and so much more. This was a hefty, even burdensome tradition for Nicholas II to protect and defend. And even though Nicholas II was keenly aware of the course of Russian and Romanov history that had come before him, especially as he celebrated 300 years of Romanov rule in 1913, stewardship of a tradition necessarily requires that one look forward to the future. For Nicholas II, that meant the succession. As one important Russian historian put it—a scholar who would never dream to call Nicholas II a “fascist”: “there was simply no responsibility of the monarch more important than the generation of viable male issue.” This is something Nicholas II accepted and understood. It’s a priority one famously finds, for example, in the 1353 will of Grand Prince Simeon Ivanovich, who was served so well, you’ll remember, by the Romanov ancestor, Andrei Kobyla. “And lo, I write this to you so that the memory of our parents and of us may not die, and so that the candle may not go out” (А пишу вамъ се слово того дѣлѧ, чтобы неперестала памѧть родителии нашихъ и наша, исвѣчабынеоугасла). Nicholas II’s chief way of maintaining alight the candle of his dynasty was, of course, to fulfill the “responsibility of the monarch” and produce “viable male issue,” to go back to our previous quote. The story of the birth and tragic illness of Tsesarevich Aleksei Nikolaevich is well known, and there can be no doubt that his hemophilia worked on the minds of both the emperor and the empress, Alexandra Feodorovna, since the heir was diagnosed with the disease shortly after his birth. Their torment was not just a father’s or a mother’s torment at the risks their son surely faced. It also was the torment of an emperor and an empress, a sovereign and his consort, responsible for that candle of dynastic continuity. Rather than retracing the well-known history of that tragic story, I would like to close my remarks by reflecting on one way the tsar preserved his family’s legacy: His stewardship of the succession. The succession to the throne in Russia has not received a lot of scholarly attention, though it has attracted the attention of some prelates, including, most notably (and very ably), our St. John of Shanghai and San Francisco, who wrote a very serious book on the subject, and it has attracted the attention of some monarchists and amateur historians. It also, of course, was quite important to the members and supporters of the Imperial House, both before and after the Revolution. Only recently, however, have historians turned their attention to the history of succession in Romanov Russia. But the succession system in Russia was something Nicholas II understood very well. When the Romanovs came to the throne in 1613, there was no formal law of succession. The Assembly of the Land that called Mikhail Fedorovich to be tsar had no manual to consult in picking the young 16 year old—no legal code to guide them. The selection of Mikhail Fedorovich was, as I suggested, driven by concern for continuity when there was none to be had: the Old Dynasty was extinct, and the boyars and churchmen of the time needed to find the best way to represent continuation, and that led to a Romanov. Even so, the custom going back even to Grand Prince Simeon Ivanovich recognized succession from father to son, though there were challenges that led to open and bloody civil war in Muscovy. Despite these challenges, the succession of a son to his father’s throne was well established by the time the Romanovs became tsars, and it continued that way up to Peter the Great. In 1722, however, Peter wrote the first actual law of succession, but it was really a non-law: it said that the emperor could pick whomever he wanted to be tsar after him, even if not a relative. It was entirely up to him. The law created confusion throughout the 18thcentury, as the succession jumped from one branch of the Romanov family to the other, often violently. Paul I wrote a new law of succession and he promulgated it on the day of his coronation, Easter Sunday, April 5, 1797, which was like the laws that were popping up elsewhere in Europe. It provided for male primogeniture—father-to-son succession—and the succession of women to the throne, if there were no male members of the dynasty alive. Paul I’s law was modified very little in the reigns of his successors. Alexander I, Paul’s son, added the provision that members of the dynasty had to marry equally, meaning other royalty, if they wanted the children of these marriages to be eligible to succeed. This didn’t disallow unequal marriages, but it did mean that children born of an unequal marriage would not be members of the dynasty with rights of succession. In 1889, Alexander III restricted the use of some titles among the now sprawling Romanov dynasty, and prohibited all unequal marriages for all dynasts. The new statute read: “Henceforth, no member of the Imperial House may enter a marriage with a person of unequal status, that is, not belonging to a royal or ruling house.” This strict rule would be softened in 1911 by Nicholas II, who limited the prohibition to the grand dukes and grand duchesses: “Henceforth,” the statute reads, “no grand duke or grand duchess may enter into a marriage with a person of unequal status, that is, not belonging to a royal or ruling house.” Other dynasts conceivably could marry unequally, provided they had the tsar’s permission, though again their offspring would not be dynasts. Nicholas II’s revisions were rooted in his weighty sense of responsibility and stewardship for the dynasty he headed. Nicholas II amended the law to assure that the Romanov dynasty would survive in a day and age when unequal marriages were becoming more common in the Romanov dynasty and widespread in other European houses. Nicholas II believed that he had to respond to the changing realities of his times while at the same time secure order and continuity in his dynasty. And he believed he had to do that by ensconcing these changes in the law of succession itself. Let me close, then, with one myth our famed Oxford scholar didn’t bust: that Russia was an autocracy in the reign of Nicholas II. There’s evidence to think it was: We know that the title autocrat (самодержавец) was officially used by Russian rulers down to the end of the Russian Empire, even after the promulgation of the 1905 October Manifesto ushered in a more or less constitutional order. We know that Nicholas II in that speech in 1895 held out autocracy as the institution he was upholding and protecting. But the fact of the matter is that Russia was a land of laws well before October 1905, whatever the tsar’s title was. To be sure, the power of the Russian emperor was expansive. But at least one vital thing was out of the control of the ruler: the succession to the throne. Part and parcel of Emperor Paul I’s new law of succession in 1797 was to undo Peter the Great’s non-law that allowed the emperor to choose his own successor. During the years between 1722 (when Peter issued that non-law) and 1797, when Paul I issued his, Russia was a genuine autocracy, where no parliament, court, legal code, or other social or political institutions limited his power—nothing except, of course, the prevailing notions of Christian monarchy, which had a very significant effect on the exercise of monarchical power in Russia in every period of its history. But the autocracy ended when Paul I wrote his law, because the key provision and justification for it was to remove the succession from the emperor’s hand and placed it in the hands of the law itself. The preamble to it states that the law had been promulgated so that “the State should never be without an Heir; that the heir should be determined by the law itself; and that there should never be the least doubt as to who is to succeed.” While it may be going way too far to state that Russia was a constitutional monarchy from 1797 on, it would be too little to say that this law restricting the most important aspect of any dynastic monarchy is unimportant. Russell E. Martin, Ph.D., Westminster College, Westminster, PA., U.S.A.
All of this only makes this commemoration of Nicholas II all the more important. It reveals that, while we know a lot about the man and the reign, we still have a long way to go before we are at a point that we can give him the historical assessment he is due. But we can start by seeing the Russian past—even the recent Russian past—through a lens we don’t much recognize, much yet use, today: the lens of monarchical, dynastic traditions. These traditions were important to Nicholas II. He tells us this in the plainest language. He ruled in ways that reflected the priorities of dynasty and tradition. Nicholas II was a Romanov, the bearer and protector of a 300-year-old tradition, and a member of a family that had served Russia and its rulers for six centuries. It would be incomplete and facile to attempt to understand his reign—or remember and commemorate his memory—without thinking about him in that context: as a family man. That family was not just his wife and children, but the entire Romanov line, for which he had a “firm and unflinching” responsibility.